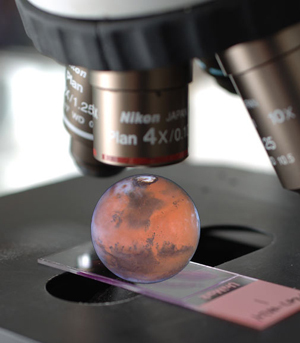 Is NASA covering up evidence of life on Mars? That’s what University of Cardiff astrobiologist Chandra Wickramasinghe claims as quoted in an article on the Helium website (warning: site has autoloading video ads). First, I want to note that this article doesn’t appear to have much new about it; Wickramasinghe made these claims as far back as 2008, and there’s no link in the article to where he may have talked about it more recently. Still, given the nature of these claims (and the knowledge that this will probably spread around the ‘net rapidly), it’s worth talking about. I’ll be up front about this: I have serious problems with lots of claims made by Wickramasinghe. He thinks that life on Earth began in space and was seeded here, a process called panspermia. That’s an interesting idea, and has been around a long time. The problem is, he sees it everywhere. In 2003 he claimed that SARS was extraterrestrial. He says a “red rain” in India in 2001 was due to alien bacteria (it is far more likely it was due to very Earthly spores). He claims that flu outbreaks – yes, influenza – come from space. So he’s had a long history of making grand claims on ambiguous evidence*. 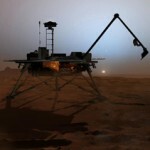 1) In 1977, the Mars Viking lander performed some analyses to look for Martian life. The results were ambiguous, unfortunately. Many NASA scientists claimed the results show no life on Mars, which is on what Wickramasinghe is basing his claims of coverup. In my opinion, no conclusion can be made either way. New results from the Phoenix lander are very interesting, indicating that there might be organics on Mars… but that doesn’t mean life, it just means there might be carbon-based molecules on Mars. That’s a long, long way from biological activity. The atmospheric methane observations are really interesting, but there is still no clear source for them. It’s still not possible to completely rule out geological sources. Life is a possible source, but not the only one. Also, there has been no discovery of liquid water on Mars. There have been lots of very interesting and provocative observations, but no real proof of extant liquid water – see here, or here, or here for example. I’ll note that these observations may point to transient liquid water – water that exists for a very brief amount of time – as opposed to a reservoir of it. So Wickramasinghe is drawing conclusions that are not supported by the evidence. Water, methane, the Viking and Phoenix results: these might point toward life, but they might not. We don’t know yet. But even if these observations do in fact indicate the presence of life, does that mean NASA is covering it up? I very seriously doubt it. Wickramasinghe’s claims of hanky panky make no sense. If NASA is covering up data, they’re doing a really bad job of it. Guess who found that Martian methane? Surprise: NASA. And it was NASA probes that see evidence for water. Again, why announce it if they’re trying to cover it up? And if NASA is trying to cover up the Viking results, then why release the Phoenix results which back up those of Viking? In fact, why launch Phoenix at all? Like most conspiracy theorists, Wickramasinghe pays way too much attention to details, and overlooks huge logical inconsistencies. And then there’s the basis for the claims of hiding evidence. Why would NASA cover up all this? Wickramasinghe’s reasoning: politics. Not to be too subtle here, but that’s pretty silly. He has it exactly backwards: if NASA found good, solid evidence of life on Mars the budget would skyrocket! Imagine one of the rovers, say, found actual biological activity in a patch of ground on Mars. The media would go nuts, and the public would want more information. We’ve seen how the ‘net goes crazy every time a story comes out about possible life on Mars – heck, I’ve had massive traffic to this very blog when I’ve written about it. Moreover, lots of people (including, critically, Congresscritters) complain about the money spent to go to Mars. That’s the opposite of what Wickramasinghe is claiming. If NASA found real evidence of life on Mars, they’d be shouting about it from the rooftops (after peer-review, of course). Instead of sending one Phoenix lander that might find ambiguous evidence of water and biology, they could send ten. Twenty. And they’d be better equipped. I know a few NASA scientists; they’d give their right arms to be able to send a fleet of big, expensive labs to Mars instead of lobbing smaller probes one at a time. They could then answer these questions once and for all, and still guarantee a line of funding for a long, long time. So to claim that NASA is covering up evidence of Martian life so that it can keep tapping Congress for money is absurd. They’d get a lot more money and attention if they made the evidence public! To recap: Wickramasinghe is basing his claims of Martian life on scanty, ambiguous evidence, and then claims “conspiracy theory” when asked why NASA would cover this up, and the evidence for that is not only non-existent, it actually points to Wickramasinghe being wrong. In my opinion, we need a lot more evidence for life on Mars. What we have is fascinating and tantalizing, but it’s a long way from solid proof. Extraordinary claims require extraordinary evidence… which is true both for finding life on other planets, as well as claims that NASA is covering up said evidence. Credits: Microscope picture from euthman’s Flickr stream; Mars and Phoenix pictures from NASA. *Yes, I’m aware that these are ad hominem arguments, but that is not necessarily a logical fallacy. If someone believes in a hundred provably-wrong things, why believe them when they make their 101st claim? Context matters, especially – as I point out in this post – the new claims are on as shaky ground as the others.